Ina May Gaskin at Nambassa 3 day Music & Alternatives festival, New Zealand 1981. Ina May Gaskin, CPM, (born March 8, 1940) has been described as "the mother of authentic midwifery." Gaskin was born to an Iowa Protestant family (Methodist on one side, Presbyterian on the other). Her father, Talford Middleton, was raised on a large Iowa farm, which was lost to a bank not long after his father’s accidental death in 1926. Her mother, Ruth Stinson Middleton, was a home economics teacher, who taught in various small towns within a forty-mile radius of Marshalltown, Iowa. Both parents were college graduates, who placed a great importance on higher education. Her maternal grandparents ran a Presbyterian orphanage in Farmington, Missouri, a small town in the Ozarks. Her grandmother, Ina May Beard Stinson, directed the orphanage for many years after her pastor husband’s death. She was an avid member of the Woman's Christian Temperance Union and a great admirer of Elizabeth Cady Stanton, Susan B. Anthony, and Jane Addams. Gaskin’s paternal grandparents were all farmers. Adam Leslie Middleton, her grandfather, traveled and worked with farmers from Iowa, Illinois, Minnesota, South Dakota, Nebraska, and Kansas in cooperative grain marketing, organizing communities, as well as larger outlets in Chicago and other large cities, to establish local cooperative grain elevators. His work as an organizer took him to Canada to work with wheat growers, and to Washington, D. C., on the invitation of the Secretary of Agriculture under President Warren G. Harding, Henry C. Wallace, father of Henry A. Wallace, President Franklin Delano Roosevelt’s Secretary of Agriculture. 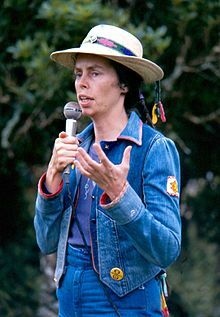 In 1971 Gaskin, with her husband Stephen, founded a commune called The Farm in Summertown, Tennessee. There, she and the midwives of the Farm created The Farm Midwifery Center, one of the first out-of-hospital birthing centers in the United States. Family members and friends are commonly in attendance and are encouraged to take an active role in the birth. "Considered a seminal work, it presented pregnancy, childbirth and breastfeeding from a fresh, natural and spiritual perspective, rather than the standard clinical viewpoint. In homebirth and midwifery circles, it made her a household name, and a widely respected teacher and writer." By the early 1990s, after multiple reprints, Spiritual Midwifery was acknowledged as a "classical text on midwifery" with a "lasting impact". Gaskin has been credited with the emergence and popularization of direct-entry midwifery (i.e. not training as a nurse first) in the United States since the early 1970s. Between 1977 and 2000, she published the quarterly magazine Birth Gazette. Ina May’s Guide to Childbirth, her second book about birth and midwifery, was published by Bantam/Dell in 2003. Her books have been published in several languages, including German, Italian, Hungarian, Slovenian, Spanish, and Japanese. Since the early 1980s, she has been an internationally-known speaker on maternity care independently and for the Midwives Alliance of North America (MANA), lecturing throughout the world to midwives, physicians, doulas, expectant parents and health policy-makers. She has spoken at medical and midwifery schools in several countries and at both the Starwood Festival and the WinterStar Symposium, discussing the history and importance of midwifery. She is the founder of the Safe Motherhood Quilt Project, a national effort developed to draw public attention to the current maternal death rates, and to honor those women who have died of pregnancy-related causes during the past twenty years. She has appeared in such prominent films as Orgasmic Birth (2009) (directed by Debra Pascali-Bonaro) and The Business of Being Born (2008) (directed by Abby Epstein and produced by Ricki Lake). She also appears in With Women: A Documentary About Women, Midwives and Birth (2006). A study of home births assisted by the midwives of The Farm (Durand 1992) looked at the outcomes of 1,707 women who received care in rural Tennessee between 1971 and 1989. These births were compared to outcomes of over 14,000 physician-attended hospital births (including those typically labelled as high risk) in 1980. Comparing perinatal deaths, labor complications, and use of assisted delivery, the study found that "under certain circumstances (low risk pregnancies), home births attended by lay midwives can be accomplished as safely as, and with less intervention than, physician-attended hospital deliveries.". The Gaskin Maneuver, also called all fours, is a technique to reduce shoulder dystocia, a specific type of obstructed labour which may lead to fetal death. Gaskin introduced it in the U.S. in 1976 after learning it from a Belizean woman who had, in turn, learned the maneuver in Guatemala, where it originated. In this maneuver, the mother supports herself on her hands and knees to resolve shoulder dystocia. Switching to a hands and knees position causes the shape of the pelvis to change, thereby allowing the trapped shoulder to free itself and the baby to be born. Since this maneuver requires a significant movement from the standard lithotomy position, it can be substantially more difficult to perform while under epidural anesthesia, but still possible, and can be performed by an experienced delivery room team. On June 14, 2008, Gaskin led a workshop called 'A Guide to Natural Childbirth' at the New York Open Center in Manhattan. She served as President of Midwives' Alliance of North America from 1996 to 2002. She received the ASPO/Lamaze Irwin Chabon Award (1997), and the Tennessee Perinatal Association Recognition Award. She was featured in Salon magazine’s “Brilliant Careers” in 1999. In 2003, she was made a Visiting Fellow of Morse College, Yale University. Ina May was awarded the title "Honorary Doctor" in recognition of her work demonstrating the effectiveness and safety of midwifery by the Thames Valley University, London, England, on November 24, 2009. On September 29, 2011, Ina May Gaskin was announced as a co-winner of the 2011 Right Livelihood Award. Gaskin's book Birth Matters: A Midwife's Manifesta was named one of the International Planned Parenthood Federation's Top 6 Books of 2011. In 2013, she was inducted into the National Women's Hall of Fame. Gaskin, Ina May (1987). Babies, breastfeeding, and bonding. South Hadley, Mass. : Bergin & Garvey Publishers. ISBN 9780897891349. Gaskin, Ina May (2014). Spiritual midwifery. Strawberry Hills, NSW: ReadHowYouWant. ISBN 9781459647077. Gaskin, Ina May (2012). Ina May's guide to childbirth. New York: Bantam Books. ISBN 9780553381153. Gaskin, Ina May (2009). Ina May's Guide to Breastfeeding. UK: Pinter & Martin. ISBN 9781905177332. Gaskin, Ina May (2015). Birth matters: a midwife's manifesta. New York: Seven Stories Press. ISBN 9781583229279. All-Fours Maneuver for Reducing Shoulder Dystocia During Labor, The Journal of Reproductive Medicine, May, 1998. Induced and Seduced: The Dangers of Cytotec. in Mothering, July-August, 2001. Retrieved: 2006-08-26. The Undervalued Art of Vaginal Breech Birth: a Skill Every Birth Attendant Should Learn in Mothering, July-August, 2004. Retrieved: 2006-08-26. A Summary of Articles Published in English about Misoprostol (Cytotec) for Cervical Ripening or Induction of Labor, 2005-09-05 Retrieved: 2010-01-22. ^ a b c Granju, K.A. (1999) "The Midwife of Modern Midwifery" Salon.com, Brilliant Careers. ^ Lorente, C.W. (1995). Mother of Midwifery: Ina May Gaskin Hopes to Birth a Local Movement of Midwives. Vegetarian Times, Special Women's Health Issue, July 1995. ^ Burfoot, Annette (1991). "Midwifery: An Appropriate(d) Symbol of Women's Reproductive Rights?" (PDF). Issues in Reproductive and Genetic Engineering. 4 (2): 119–127. Retrieved 23 April 2018. ^ Eardley-Pryor, Roger (2017). "Love, Peace, and Technoscience". Distillations. 3 (2): 38–41. ^ The Quilt Project Archived 2006-02-09 at the Wayback Machine. ^ "Ina May Gaskin". Retrieved 19 September 2016. ^ Durand, Mark A. (1992). The Safety of Home Birth: The Farm Study, American Journal of Public Health, 82:450-452. ^ "Ina May Gaskin –". Retrieved 19 September 2016. ^ Demott, Kathryn. (Nov. 1, 1999). Gaskin Maneuver is Gaining Popularity OB/GYN News. ^ "Open Center - Explore. Fulfill. Transform". Retrieved 19 September 2016. ^ "Solar power pioneer Huang Ming wins 'alternative Nobel'". 29 September 2011. Retrieved 19 September 2016 – via www.bbc.co.uk.